iBall unveils the budget Slide 3G 8072 tablet, features Android 4.1 and dual SIM. 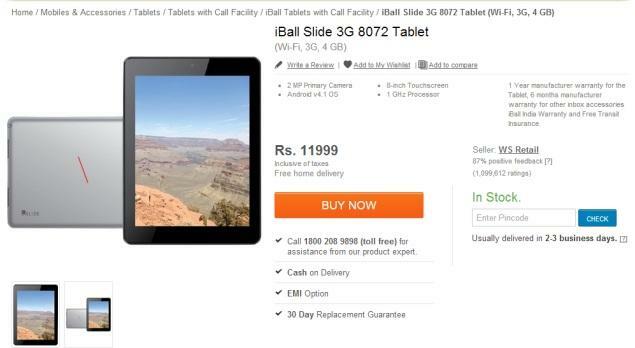 The iBall Slide 3G 8072 is available on Flipkart at a price of Rs. 11,999. The tablet boasts of a voice calling, dual SIM and Android 4.1 Jelly Bean OS. The iBall Slide 3G 8072 tablet has an 8-inch display with 1024x768 pixels resolution. It has a 1GHz dual core Cortex A9 processor and runs Android 4.1 Jelly Bean. The iBall Slide has a 2MP rear camera as well as a front facing camera for video calling. It comes with 1GB of RAM and 4GB inbuilt storage expandable up to 32GB via microSD card support. It comes with a 4000mAh battery. Connectivity wise the tablet comes with dual-SIM (GSM GSM) support with voice-calling and dual standby and offers Wi-Fi and 3G support. The tablet is available in black and grey colours. 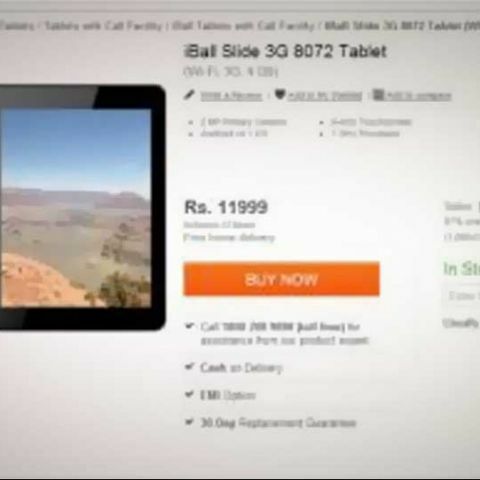 Recently iBall had launched the Edu-Slide educational tablet for IIT aspirants at Rs. 30,999. It comes with educational content for IIT-JEE entrance test aspirants and includes a master problem package. The tablet is available in two variants - Wi-Fi and 3G for Rs. 30,999 and Rs. 35,999 respectively. The iBall Edu Slide tablet has a 10.1-inch IPS HD display with 1280 × 1024 pixels resolution. It runs on Android 4.1 Jelly Bean out of the box. The tablet has an 8 MP rear camera and a VGA front facing camera for video calling. It has 8 GB in-built memory expandable via MicroSD card slot to 32 GB. Connectivity wise the WiFi tablet supports an integrated HDMI port, Bluetooth and 3G via USB dongle. The 3G SIM compatible variant supports dual-SIM support and GPS along with HDMI, Bluetooth and 3G connectivity.